Often, a product could fail due to any of several possible causes of failure. For a non-repairable component, each unit can only fail once; hence, if the occurrence of any one failure mode results in a failure of the component, then the failure modes are said to "compete" to cause the failure. This equation is identical to a system of components in which each component is in a series configuration. This also leads to the statement that the reliability of the product cannot exceed the reliability of the most prevalent (critical) failure mode. In the analysis of each failure mode, the failure times for the mode being analyzed are considered to be failures and the failure times for all other modes are considered to be suspensions. These are suspension times because the units would have continued to operate for some unknown amount of time if they had not been removed from the test when they failed due to another mode. 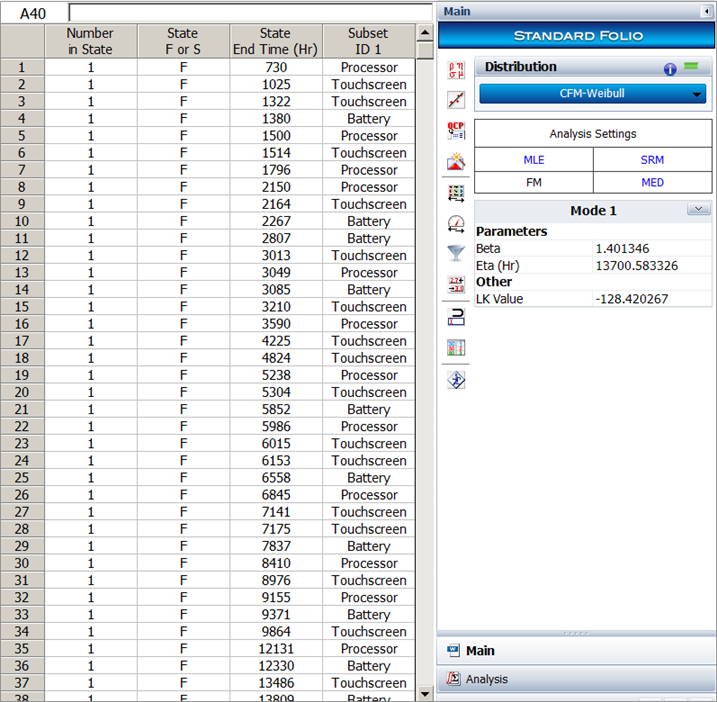 The following example illustrates the use of the competing failure modes (CFM) analysis within Weibull++ in Synthesis 9 and highlights the use of the Batch Auto Run utility to analyze the various failure modes individually. A company rushed a cellular phone to the market and has been receiving complaints that the phone is not as reliable as expected. The company has been collecting data on the returned phones to determine the cause of the failures to go along with the in-house testing values already collected. (For this example, we are assuming that the phone is operating 24 hours a day, or a duty cycle = 1.) The three main failure modes of the phone are due to the processor, battery and touchscreen (not drop-related). Based on this data sample, the company would like to find out what the estimated reliability of the product is after one year of use (to prepare for the warranty nightmare that is coming) and to learn which component should be the focus of improvements for future designs. As the three main failure modes are independent of one another, CFM analysis can be used to analyze the data to determine the phone’s overall reliability. 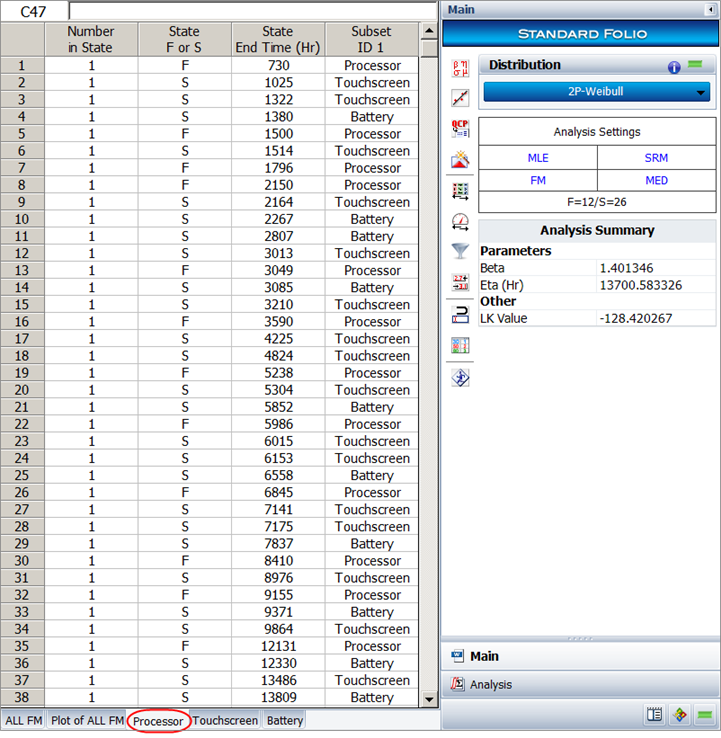 During the analysis, the failure times for all other failure modes not being analyzed are considered to be suspensions. For example, when analyzing the failures due to the processor, all failures caused by the touchscreen and the battery are considered suspensions. Using the above data, the first five data points would be seen as: a failure at 730 hours (processor); suspensions at 1,025, 1,322 and 1,380 hours (not processor); and a failure at 1,500 hours (processor again). After entering the failure times and the associated subset IDs that identify the failure modes in a Weibull++ standard folio, choose Competing Failure Modes > CFM-Weibull for the distribution and MLE for the analysis method. Click Calculate. 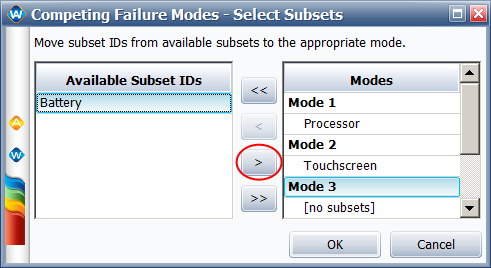 In the Competing Failure Modes - Select Subsets window, assign each subset ID to a different mode. An example is shown next. The results for Mode 1 (processor) are shown next. Use the Probability plot to verify that the chosen life distribution models the data. 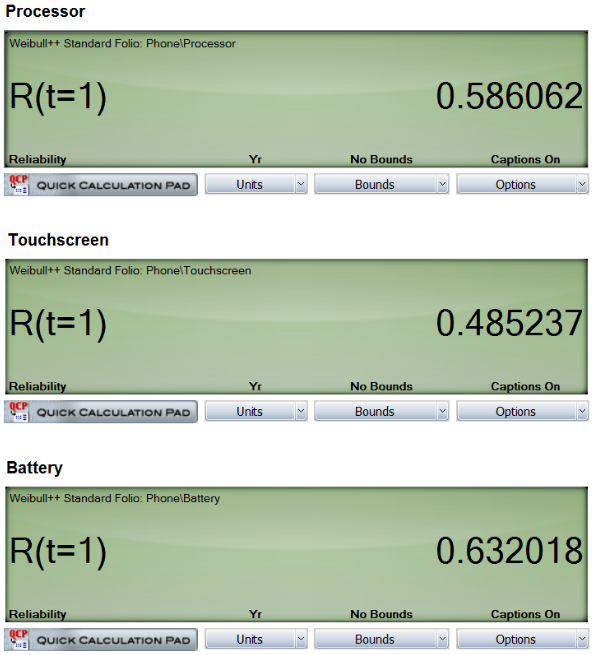 From the QCP, it is calculated that the reliability of the phone at 1 year is only 18 percent. This reliability is much too low (as observed by users), and therefore the individual failure modes need to be analyzed separately to determine which one is the most critical (worst reliability) for the sake of future sales. To do this, you could manually copy and paste all the data into three new data sheets, and then change all data points from the non-analyzed failure modes on that sheet into suspensions. 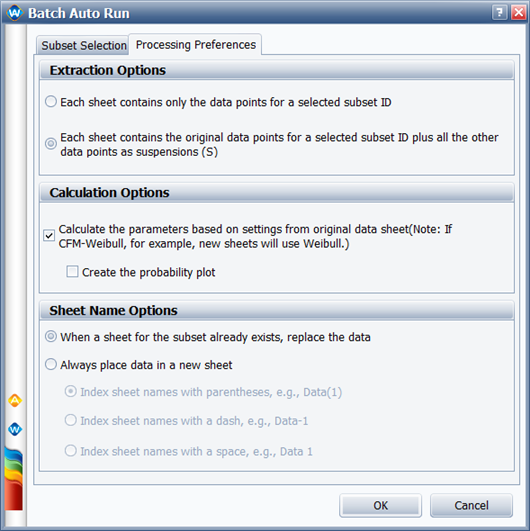 A faster and simpler option is to use the Batch Auto Run utility. Click the icon on the Main page of the control panel. 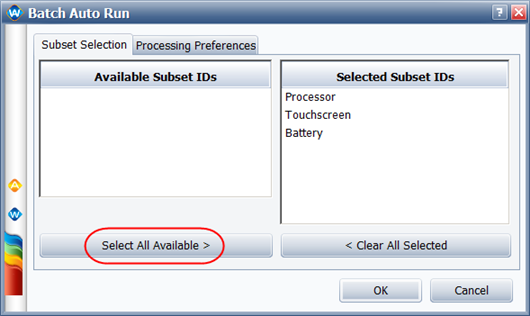 In the Subset Selection tab, click Select All Available to select the three modes to be extracted to their own separate data sheets. Now the reliability of each failure mode can be estimated using the QCP at one year to determine the lowest and thus most critical failure mode to improve upon first. From the above results, it can be determined that the touchscreen is the least reliable part of the cellular phone, and therefore should be the part that is addressed first. 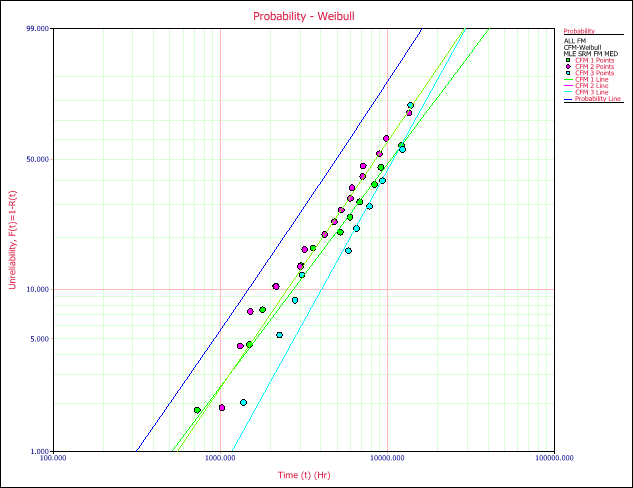 In this example, we went over how to analyze a product in Weibull++ using competing failure modes, and how to use the Batch Auto Run utility to quickly separate and analyze the various failure modes individually to determine which one is the most critical with respect to the reliability of the entire product.